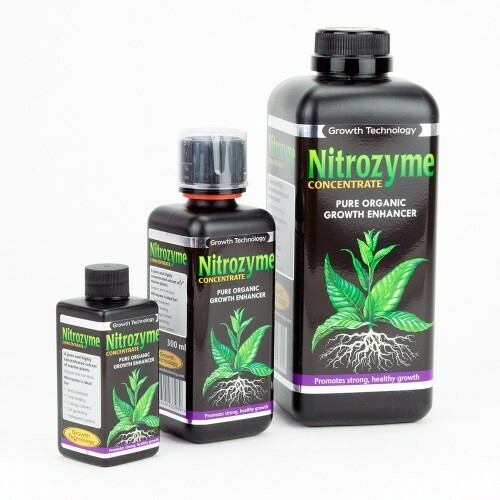 Nitrozyme has been scientifically formulated to increase crop yields, photosynthesis capacity and chlorophyll content. Nitrozyme has ultimate plant growth hormones and essential micro nutrients that have been manufactured with the integrity of the biological and chemical enhancers left in-tact. Nitrozyme is 4 times stronger than other leading brands for the quality of the organic bio-stimulant concentration to increase cell wall strength, relief of stressors, protect from diseases and optimal root strength and growth. Natural species of sea kelp provide the purest form of microbial activity for the soil improving the overall health of the medium and the plant life. With larger and stronger roots Nitrozyme increases the nutrient uptake for balanced growth and improved strength of plant cells and crops. Want the best health and strength for your plants and their root structures? Nitrozyme will increase crop yields while protecting your plants from disease and stressors while increasing nutrient uptake propelling the best overall health and production of crops and plant life. Dosage: During initial stages of growth of commercial crops use 1 to 1.5 gallons of Nitrozyme per acre for the season. For smaller applications use 3 to 4 ½ ounces of Nitrozyme per 1000 square feet per season or 1 ounce per 1000 square feet per month. Small Cuttings And Seeds Propagation Kit The small propagation kit is designed to include all ..
Large Cuttings And Seeds Propagation Kit The large propagation kit is equipped with everything..